services agencies in Los Angeles. Unable to participate in one of our 5K events but want to help the homeless? ​providing food, clothing, and shelter to homeless children, teens, adults and families. Fundraising Dinner Benefitting ​the Homeless! 15% of the dinner's proceeds was donated to PFKF. 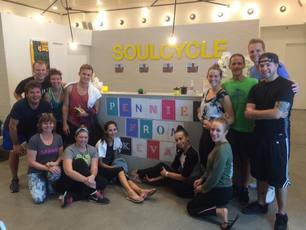 A great event, thanks to the riders and our gracious hosts at Soul Cycle Brooklyn Heights. serve hot meals and provides clothing year round to the homeless and very poor in Philadelphia and Los Angeles. and SoulCycle staff for such a great event. More than 40 'artists' painted a van Gogh, inspired by Kevan's love of nature and the outdoors, while raising funds for the homeless. ​Giving from the Heart for Valentine's Day! ​Shoppers at Super Fresh, 5th & Pine Streets, in Philadelphia, opened their wallets and their hearts during the week before Valentine's day, as PFKF collected toiletries and non-perishable food items for the homeless. every time you shop at www.amazon.com. Through the AmazonSmile Foundation, 0.5% of all purchases can go directly to the PFKF! Just shop at ﻿https://smile.amazon.com/ch/47-1789647 and PFKF will receive a portion of the purchase price for anything you buy! There are no hidden costs or fees to PFKF or for Amazon customers.